Lest We Forget – Run. Ride. Roam. Well, there was no need to worry about missing the alarm or missing the bus, for our early morning departure to the Anzac Day dawn service. Simple reason…I didn’t go to sleep…at all! I’m now sitting on 36 hours straight with no sleep, so I hope I crash later tonight. 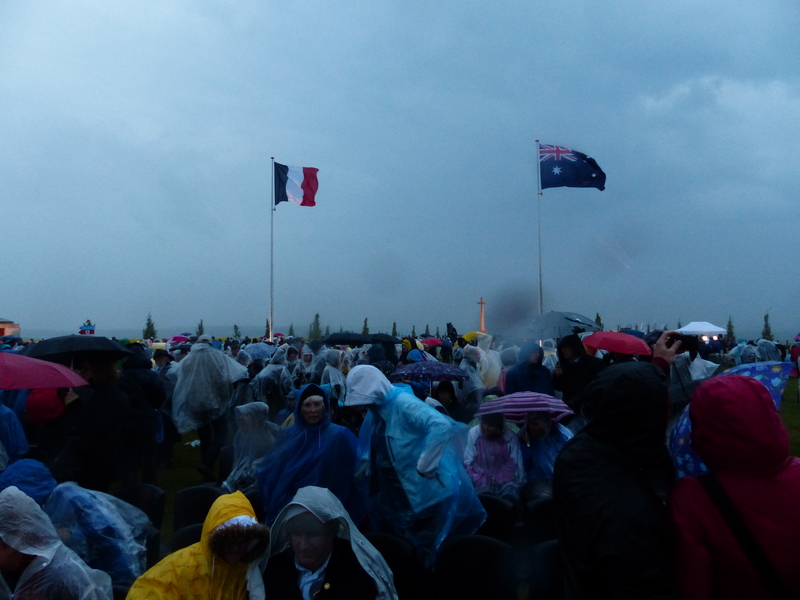 At 1:00am I finally got up and dressed in multiple layers, ready for the service at the Australian National Memorial in Villers-Bretonneaux. The forecast was for rain and as we set foot outside the door, it had already arrived. We walked the quiet 3km into the city where we were to catch our shuttle bus and ended up arriving an hour early, so sat in the peaceful, still sleeping town, while the drizzle fell about us and waited for others to arrive. The good news was though…my new waterproof trousers got a test run and they proved to be…WATERPROOF! A nice change from the last pair and while these continue the theme of seriously dodgy fashion statements, they do the job! Our fellow shuttle passengers soon arrived, many Aussies, with that unmistakable and quite unique accent permeating the still, pre-dawn air. We exchanged some g’days and then our bus arrived and we all piled on. Florence was our “bus captain” and she was delightful. She worked for the tourist board and was in charge of the shuttle service for us and she gave us instructions and directions and walked up and down the bus to make sure we had all understood, and if we were all OK and happy. We were then presented with a souvenir badge and magnet. 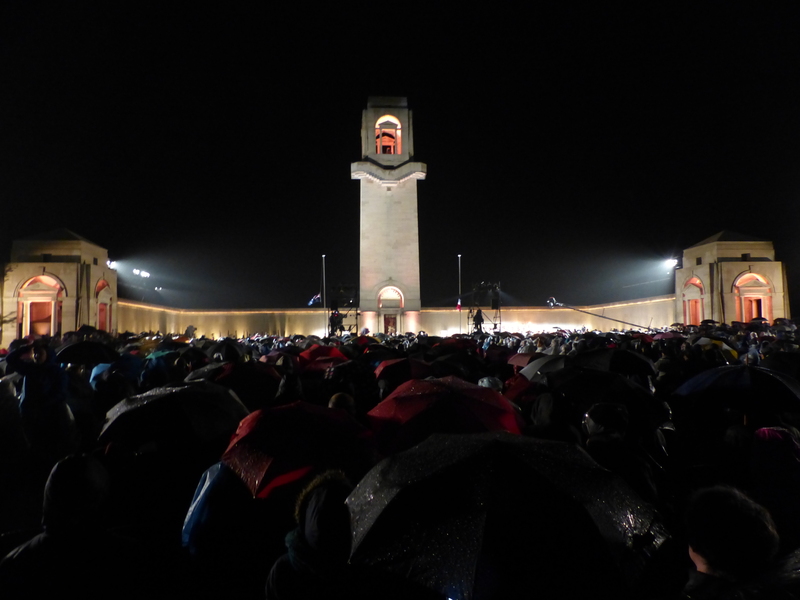 We arrived at the Memorial and walked through the now quite heavy rain, up the hill, through the cemetery and on to the Memorial itself, where the big screens were lit up and the media were in position. We found a chair and lowered ourselves gingerly and a little reluctantly into the puddle that had formed in the plastic seat and watched the pre-service performance. There was a school choir, the navy choir and band and they were wonderful. 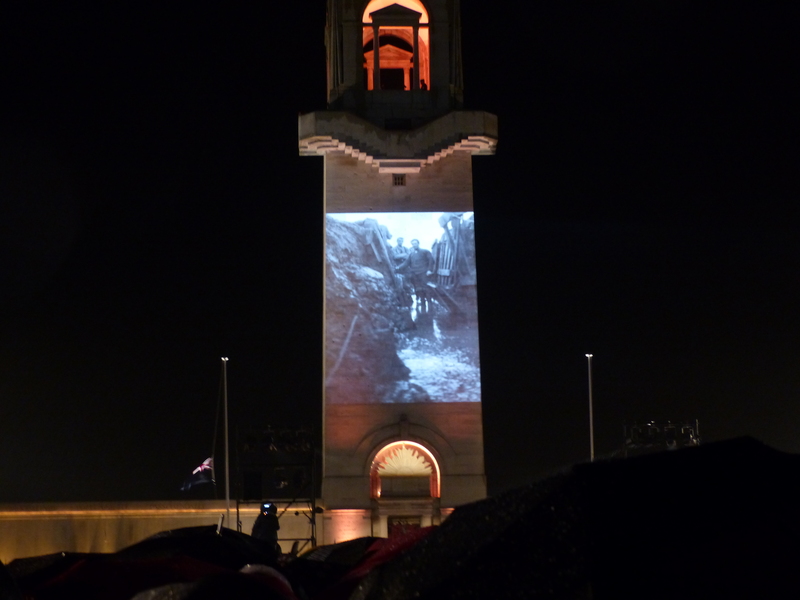 It was very moving to watch images of the Great War projected onto the Memorial’s tower, while the choir sang. 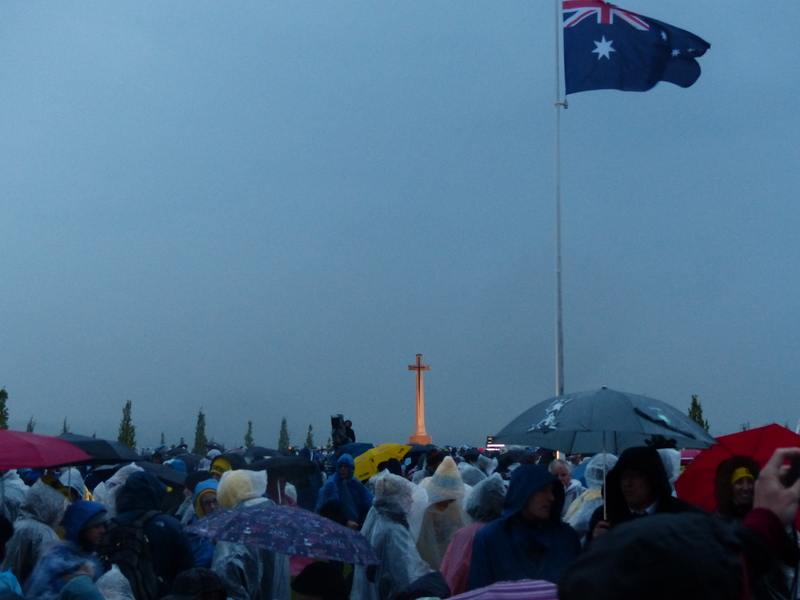 The service was obviously being run according to the television coverage because the MC announced a slight delay to the start while they waited for the coverage at Gallipoli to finish. Then it began, a very moving service at a place that holds such significance and meaning to Australia and our place in World War I. The rain continued to pelt down, the wind blew strongly and it was very very cold. I thought it was quite fitting that we sat there, in those conditions, as a very slight reminder of what the men and women endured in the mud and rain of the trenches and life on the western front. 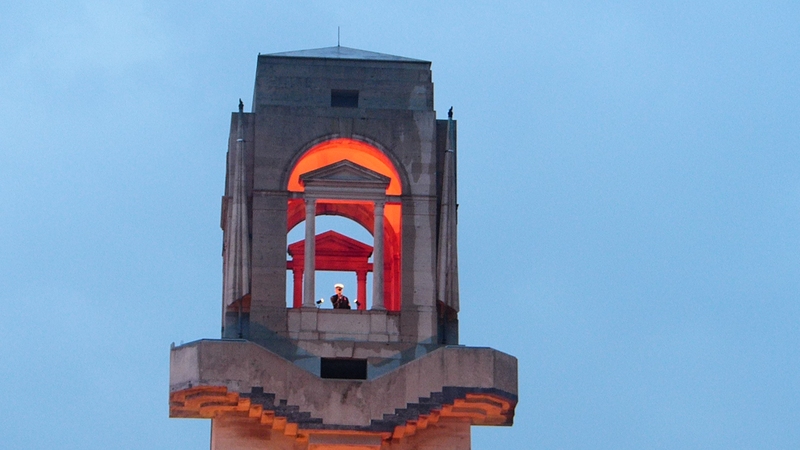 Then a lone bugler played the Last Post and Reveille, high atop the Memorial’s tower. It was so moving to hear that music played in the emerging dawn, through the mist and the rain. 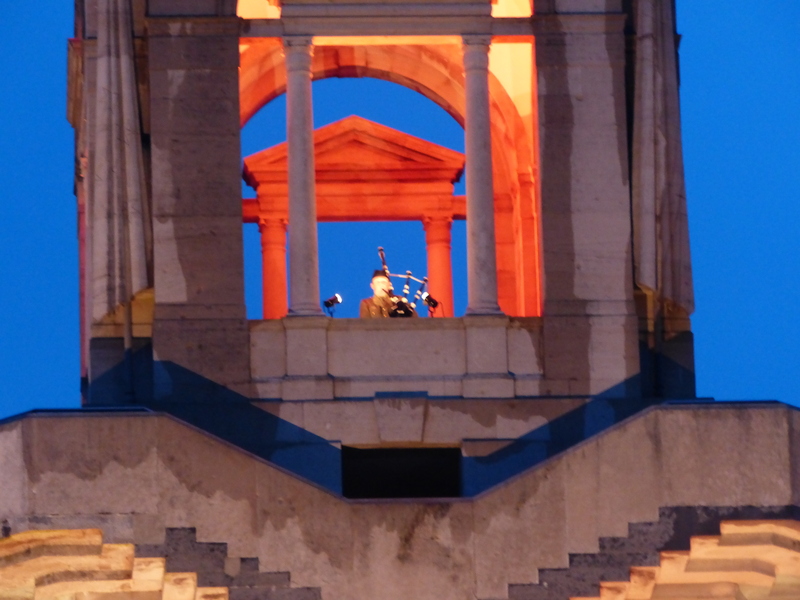 Wreaths were laid, during which a lone bagpiper played, again standing atop the tower. It could do nothing less than raise goose bumps. The national anthems of Australia and France were played, the contrast of the stirring and lively La Marseillaise and then the slow and somewhat subdued Advance Australia Fair. When the service concluded we walked back to the meeting point for our bus and to be reunited with the lovely Florence. We had been instructed to meet at 7:00 as the bus would be leaving at 7:30. We stood in the rain, eyes glued to the screen that announced the numbers of the buses as they were arriving. We must have looked like a mismatched, soggy and dishevelled group of Bingo enthusiasts as we stood and willed number 25 to come up and appear on the screen…14…21…26..54…32…OK they obviously aren’t running in order…62…24…12…It turned out we stood there in the cold and the rain for another two hours, waiting for our bus to arrive! Steve was wearing four layers on top and two on the bottom and he said he was cold. I was wearing seven layers on top in a mixture of thermals, vests and jackets and two on the bottom and I was freezing and had lost all feeling in my feet! Again though, my mind only turned to the conditions one hundred years ago when the forces were there, in that place, across those fields, in quagmires, enduring so much worse. Our bus eventually arrived and Florence guided us aboard, apologised for the delay and set about walking up and down the bus handing out lollies to everyone. She told us this was her first week on the job and this was her first major outing in her new job! She did splendidly. 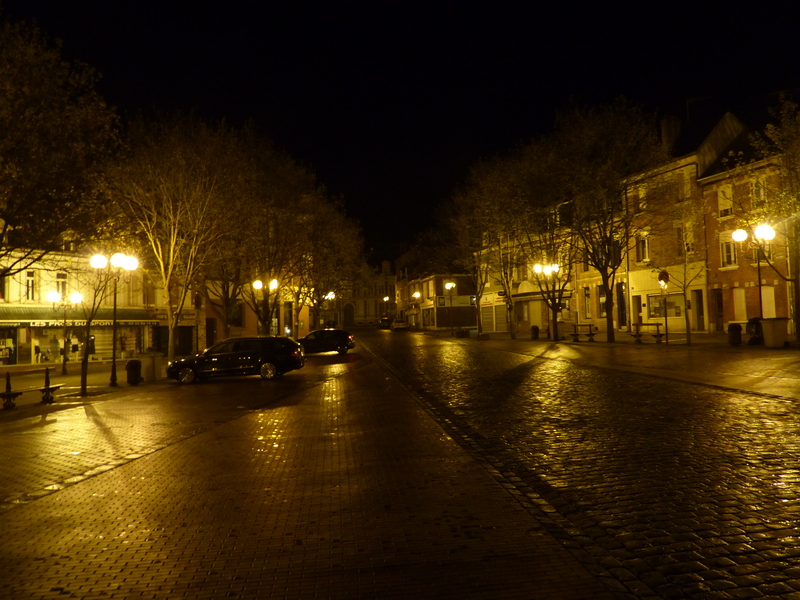 When we arrived back in Peronne, we power-walked the 3km back to the hotel, I jumped in the shower to thaw, then set about demolishing a warming bowl of oatmeal, to the dulcet tones of Steve’s snoring, as he had promptly crashed and was out for the count! I couldn’t sleep now I was up, and had been up for so long! So I’m still going. The rest of the day was spent quietly, drying out clothes, drinking umpteen cups of hot beverages and beginning to plan our forward progress. It was a very moving day, an event I’m so very glad I was able to experience and has created another chapter in the narrative that’s developing as we navigate our way around the historical battlefields of WWI and WWII. As we cycle along in peace, we look upon a landscape that once represented nothing but conflict and fear and I’m again reminded of what’s been endured here and of the character of those that lived it. Thanks Jan, I’m just glad you’re there to share them with. Thanks Lara. I also had a lump in the throat and a quivering lip at times. I’m glad the blogs are going someways to sharing our experiences. Thanks for the lovely comments. Despite the cold it would have been amazing to be there. I watched the service on TV but didn’t spot you or Steve in the crowd. It was an amazing experience. Steve saw us on the French TV coverage right at the end. Thanks for the comments, I’m glad they’re working now!